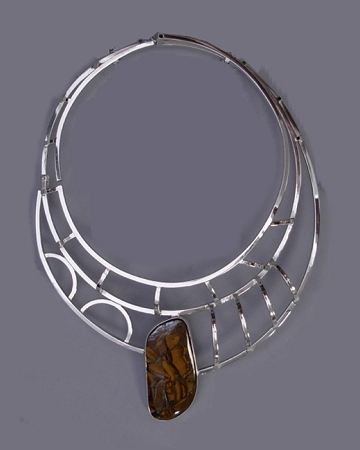 Modernist Jewelry - This is a bold handcrafted high polished sterling silver collar that features a freeform brown and black Tiger Iron cabochon gemstone. This gorgeous dramatic choker is a One-of-a-Kind necklace. One-of-a-Kind Necklace. This is a Sterling Silver art deco style collar which is handmade from square silver tubing shaped and soldered to create a three-dimensional piece of art. The choker is accented by a fully bezeled freeform Tiger Iron cabochon, which is a combination of Tiger Eye, Red Jasper, and Black Hematite that came from Australia. This collar is signed and handmade by Aaron Rubinstein and Modern Art Jewelry.